Resource Person for Bio-Informatics.Date of interview-09.09.2015 at 11:00 AM. Resource Person for Public Administration.Date of interview-10.09.2015 at 11:00 AM. Resource Person for Computer Science & Application.Date of interview-11.09.2015 at 09:30 AM. Resource Person for Statistics.Date of interview-11.09.2015 at 12:30 PM. Resource Person for Mathematics.Date of interview-11.09.2015 at 2:30 PM. Resource Person for Visual Arts.Date of interview-11.09.2015 at 09:30 AM. Resource Person for Bio-Technology.Date of interview-11.09.2015 at 10:00 AM. Resource Person for Civil Engineering.Date of interview-11.09.2015 at 11:30 AM. Resource Person for Mechanical Engineering.Date of interview-11.09.2015 at 12:30 PM. Resource Person for Electronics & Communication Engineering.Date of interview-11.09.2015 at 2:30 PM. Resource Person for Business Economics.Date of interview-11.09.2015 at 11:00 AM. 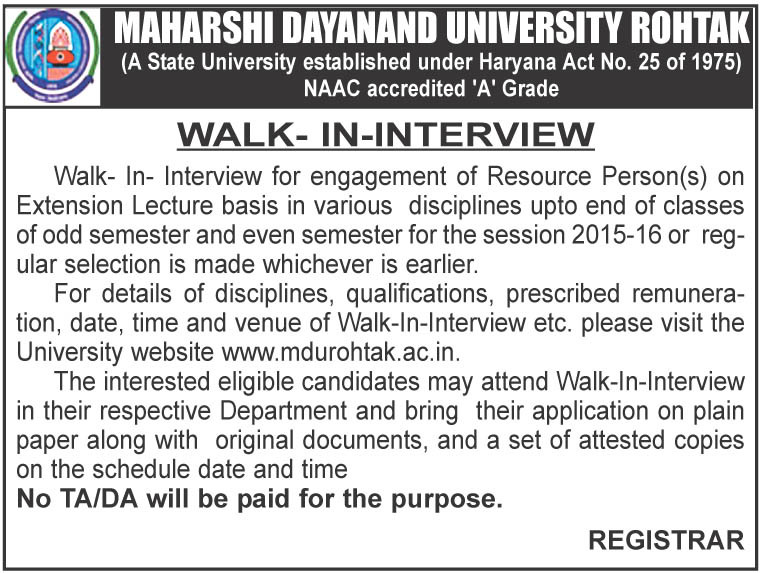 Resource Person for Physical Education.Date of interview-11.09.2015 at 11:00 AM. Resource Person of Law for UILMS, Gurugoan.Date of interview-11.09.2015 at 11:00 AM. Resource Person of Management for UILMS, Gurugoan.Date of interview-11.09.2015 at 12:30 PM. Domain knowledge and Teaching Skills-30 Marks.